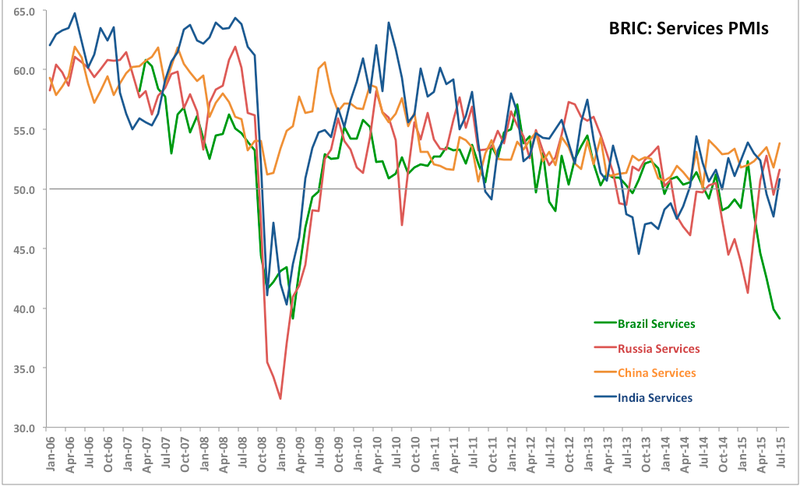 I covered BRIC economies' Manufacturing PMIs for July here: http://trueeconomics.blogspot.ie/2015/08/4815-bric-manufacturing-pmis-july-2015.html. Now, let's take a look at Services PMIs and Composite. Brazil Services PMI fell from an extremely poor 39.9 in June 2015 to an abysmal 39.1 in July, reaching a joint historical low (total history for the series spans 101 months). July reading was so poor, 3mo average through last month fell to 40.5 against 3mo average through April 2015 at 48.3 and 3mo average through July 2014 at 50.7. Per Markit: "The downturn remained widespread across the services categories covered by the survey, with all of the sub-sectors registering substantial falls in business activity. The steepest contraction was at Hotels & Restaurants, followed by Transport & Storage. The level of new business in the service economy decreased for the fifth straight month in July. The pace of reduction was slightly faster than in the prior month, but nonetheless still less severe than in May (when new business fell at the quickest pace since April 2009). Brazil's woeful Services PMI was compounded by a drop in Manufacturing (see summary of both below), driving official Brazil Composite PMI deep into contraction territory at 40.8 against already extremely low 41.0 in June. Overall, Composite index has hit the lowest point since March 2009. Russia Services PMI strengthened from 49.5 in June to 51/6 in July marking the return to growth in the sector. On a 3mo average basis, July 2015 reading was at 51.3, well ahead of 3mo average through April 2015 (46) and 3mo average reading through July 2014 (48.5). 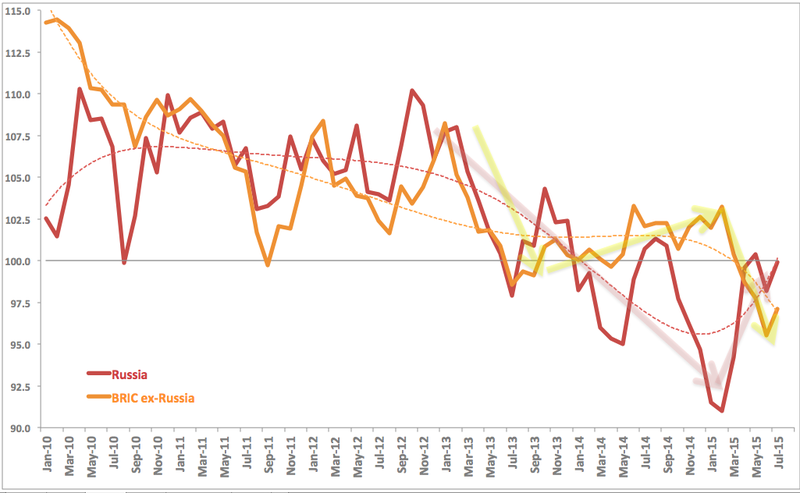 However, Russian Manufacturing PMI (see separate coverage here: http://trueeconomics.blogspot.ie/2015/08/3815-russia-manufacturing-pmi-july-2015.html). The respective Russian Composite Output Index improved to 50.9 in July, up from 49.5 in the preceding month. Per Markit: "Supporting the rise in overall activity for the service sector was a fourth consecutive month of increasing volumes of incoming new business. Moreover, the rate of growth accelerated to the highest recorded for twenty months amid reports that a more positive economic climate was driving demand for services upwards." More details on both Russia Composite PMI and Services PMI here: http://trueeconomics.blogspot.ie/2015/08/5815-russian-services-composite-pmis.html. Overall: these are some tentative early-stage signs of economic stabilisation and possibly recovery. Too early to call a new trend, however, and any talk of real recovery will require sustained rise in Manufacturing PMI above 51-51.5 mark. China Services PMI posted yet another above 50 reading (the Index never once dipped below 50.0 mark) rising strongly from 51.8 in June to 53.8 in July. This is the strongest reading in the Index since August 2014 and brings 3mo average through July 2015 to 53.0, up on 52.4 3mo average through April 2014 and on 51.3 3mo average through July 2014. Sub-50 reading in Manufacturing PMI reflective of further worsening in manufacturing downturn in the economy (ongoing since November 2014 with a brief interruption in February 2015) meant that China Composite PMI posted "only fractionally above the neutral 50.0 mark at 50.2, down from 50.6 in June, and pointed to the weakest rate of expansion in 14 months." Overall: China remains on slower growth path with Manufacturing under significant pressure. This trend is linked to the fortunes of global trade flows (more so than Services) and to weakening investment outlook for Chinese firms. India Services PMI rose to 50.8 in July, marking a very shallow recovery in the sector and breaking two months streak of sub-50 readings. July reading was up on 47.7 in June and on a 3mo average basis, figures through July 2015 are at 49.4 - signalling weak contraction against 3mo average through April 2015 at 53.1 and 3mo average through July 2014 at 52.3. Strong Manufacturing performance in PMI terms and weak, but above 50 reading in Services provided upside support for the Composite PMI. Per Markit: "After having fallen in the previous month, output across the combined manufacturing and service sectors in India rose during July. The seasonally adjusted Nikkei India Composite PMI Output Index climbed to 52.0 from 49.2 in June to signal a modest increase in activity. Growth has now been recorded in 14 of the past 15 months. The return to expansion was helped by a first rise in services activity in three months and an acceleration in the rate of manufacturing production growth." Overall: India regained its strong performance dynamic in July across both sectors, with relatively weaker performance in Services. 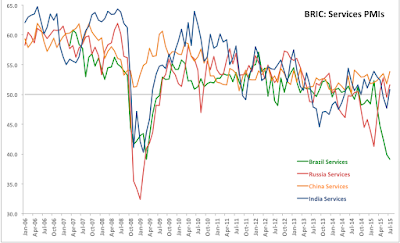 Indian economy currently leads the BRIC group in terms of growth momentum as signalled by PMIs. 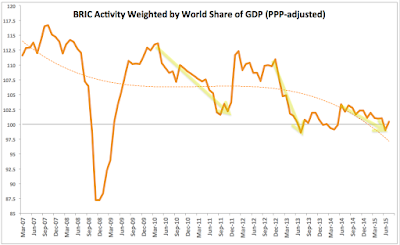 Overall, BRIC activity as contributor to global growth has improved, remains weak. 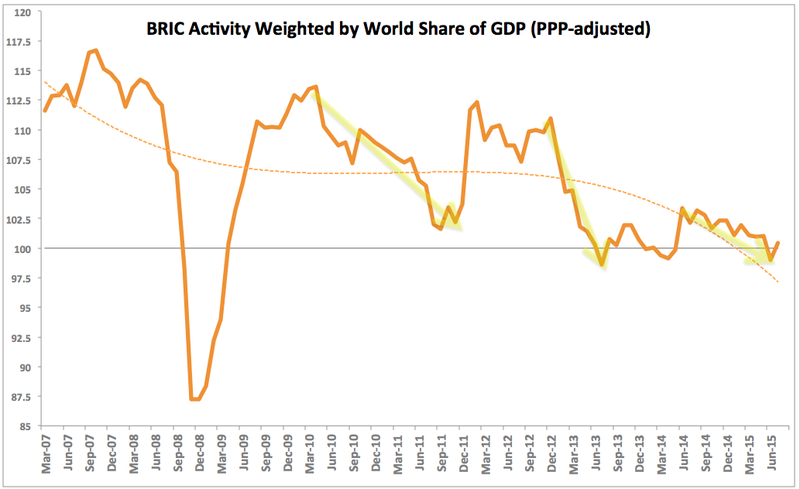 In June, the BRIC group of economies was contracting and exerting downward pressure on global growth. However, in July, they made a positive contribution, albeit extremely shallow. This, however, is of little consolation to an economy in a recession.